Bengal police officers dressed in plainclothes crossed over from Darjeeling in Bengal to Namchi in Sikkim pretending to be tourists. Fully armed, the officers raided a secret meeting of the Gorkha Janmukti Morcha ( GJM ), the political party spearheading the movement for a separate state – Gorkhaland. They arrested at least nine political activists at the meeting but many including the head of the Morcha, Bimal Gurung, fled. 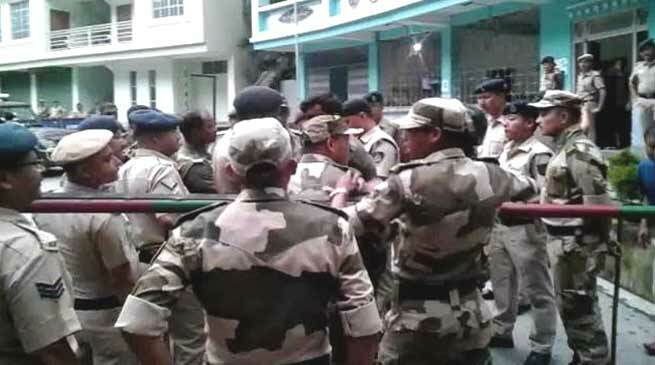 West Bengal police saying it had put out lookout notices for Bimal Gurung, GJM’s general secretary Roshan Giri and its youth leader Prasant Gurung. Their photos will be put up at airports and railway stations to make it difficult for them to travel. On the toher hand Sikkim police have filed a complaint against their counterparts from Bengal. The controversy comes 80 days after shutdown began in Darjeeling and three days after Bengal Chief Minister Mamata Banerjee met Morcha’s Benoy Tamang in Kolkata along with other hill party representatives minus its chief Bimal Gurung.